Inextricably linked with the story of the Summerstown182 is an event from a later war which struck a huge blow to this community on 19th November 1944. On that Sunday morning, a V2 rocket smashed into Hazelhurst Road, killing 35 people and injuring over a hundred. The seventieth anniversary of this in November 2014 was marked with a service in nearby St Mary’s Church and a ceremony at the location. 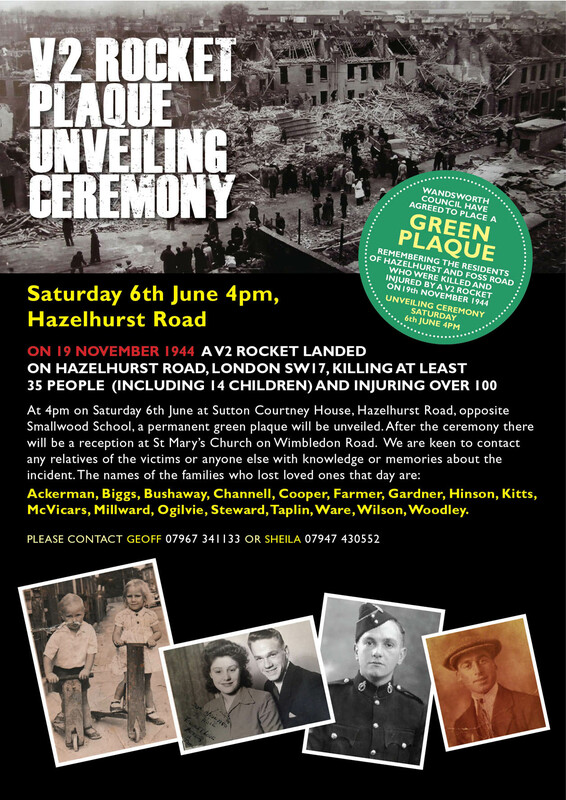 Subsequently Wandsworth Borough Council agreed to place a green heritage plaque on the site and this was unveiled 0n 6th June 2015 at a very well-attended and moving event. Many of the victim’s relatives were present as well as at least a dozen people who were actually there that day when the bomb fell. Between these ceremonies, many individual stories and testimonies were gathered, primarily to form an archive of the incident. These memories have been painful and we are very grateful to everyone who has spoken to us. They are very precious and we are anxious that they should be permanently preserved in some kind of publication which in time we hope to produce. If you have any memories about what happened that day or know someone who can tell us something about it, please do get in touch. For an account of ‘Green Plaque Day’ please see this article which was written by Geoff Simmons for the TootingPRSS website. 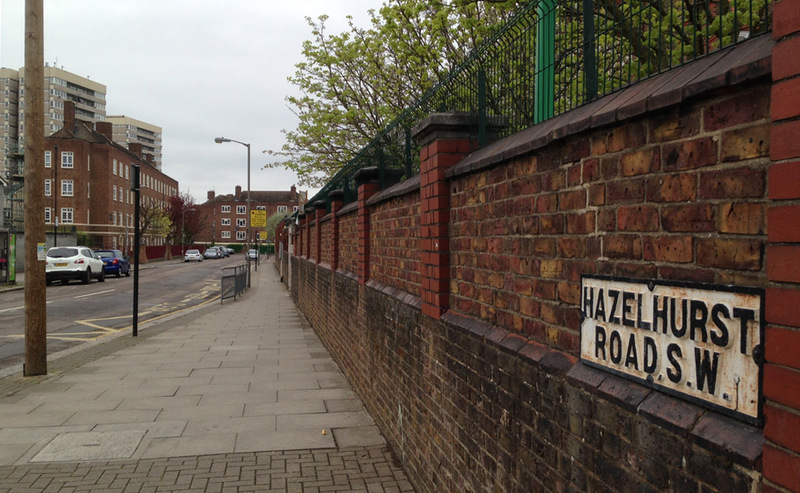 As we have tried to find out more about the twelve Summerstown182 soldiers whose homes were on Hazelhurst Road, a recurring theme has been the event which shattered this neighbourhood and in the words of a local councillor and newspaper editor at the time, Alfred Hurley, ‘reduced Hazelhurst Road to something approaching a shambles’. At 830am on the morning of Sunday 19th November 1944, a V2 rocket landed here, on the homes almost directly opposite the front of Smallwood School. At least thirty five people were killed and over one hundred injured. Among the dead were fourteen children. The oldest victim was 92 years old, the youngest just six months. Fifty properties were completely destroyed. A 1947 map shows an immense gap on Hazelhurst Road between numbers 12 and 46 where the houses should have been. The above photo would have been taken from one of the upper floors of the school, looking across the main area of devastation with the backs of the damaged houses on Foss Road clearly visible. 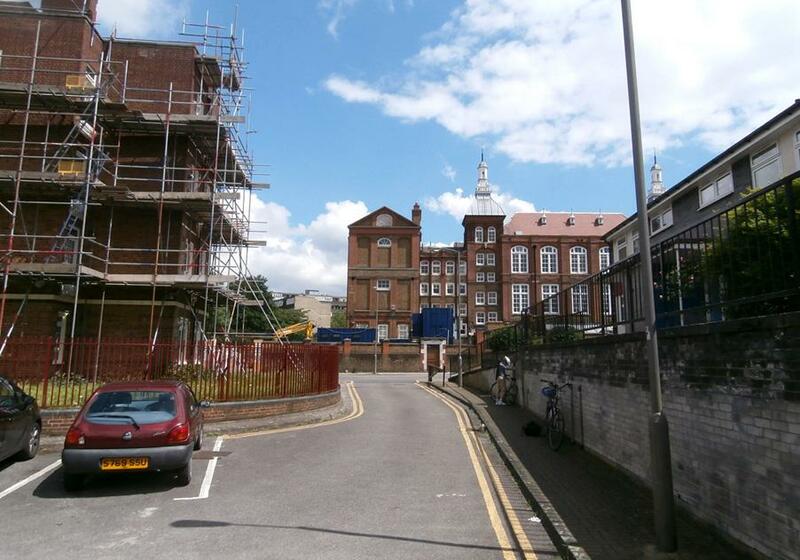 The school was used at the time by the London Fire Brigade. 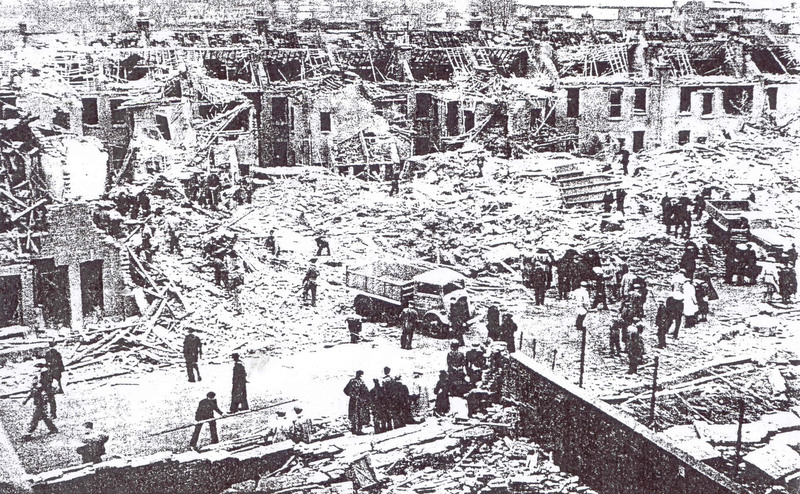 It was one of the most devastating bombing incidents in the Borough of Wandsworth in the Second World War. 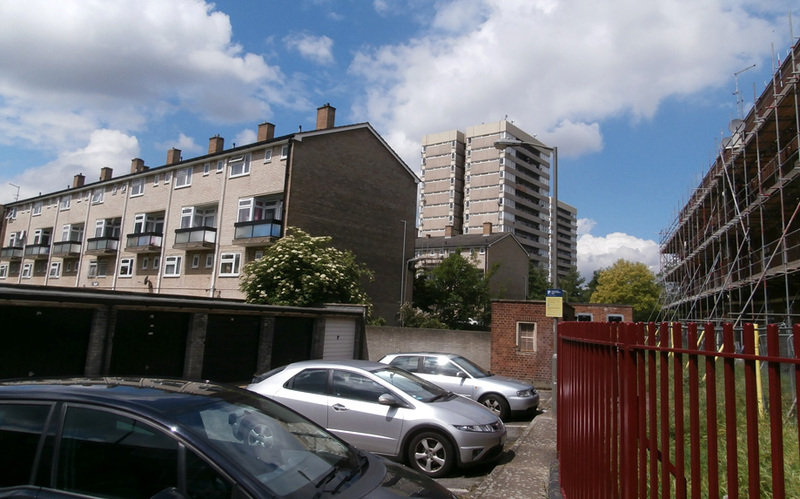 The area has now changed beyond all recognition with extensive redevelopment in the sixties and seventies. 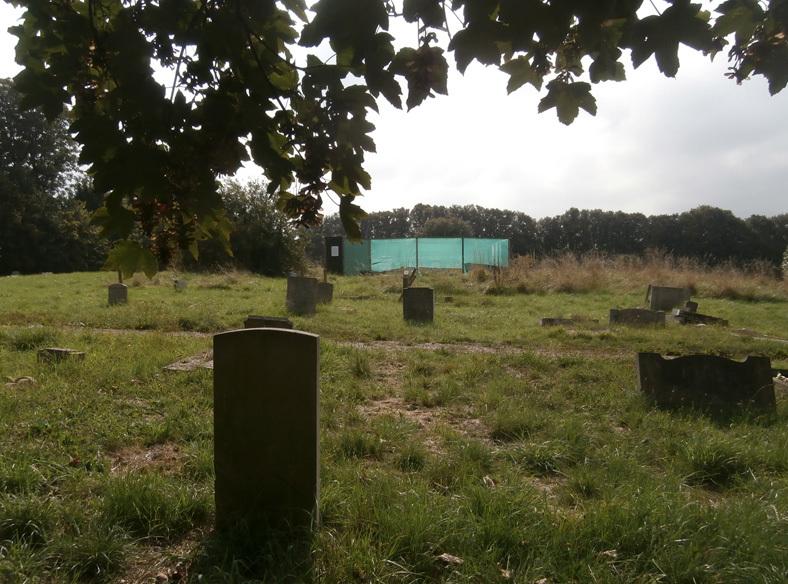 There is nothing at the scene now to remember it, though a slightly sunken car-park and group of garages behind Sutton Courtney House, on the Hazelhurst Estate indicates where the twenty foot deep crater was. In the course of my 182 research, through Ron Lankshear’s website, I started corresponding with Lynda Biggs. Her father lived at No36 Hazelhurst Road but was on active service when the bomb fell. Unfortunately his sister Nellie, Uncle Chris and cousin Douglas were all killed. Doug Kitts’ story is particularly tragic. A corporal in the Royal Signals Corps, he had been evacuated at Dunkirk, then taken prisoner at Tobruk. Incredibly he escaped from his POW camp and made his way back to Britain, only to be killed that November morning. He was 24. We were very proud when Lynda visited Summerstown in the spring last year and joined us on the Guided Walk. Later, we re-visited the location to try and identify the site of her family’s old home. Using a photograph of the aftermath of the explosion and a street-map which indicates the original house numbers, we followed the course of a wall to the left of Smallwood School. This allowed us to pinpoint where No36 was. To the right of the sunken garage area, a small elderflower tree just coming into flower marked the spot. It was an extremely moving experience and rarely have I felt so in touch with history. We know of families of at least four Summerstown182 soldiers who have direct connections with the events of thirty years later. Horace Woodley lived at No26 and his family were still there in 1944 and his niece Josephine Woodley aged just fourteen was one of the victims. Living at No28 was Minnie Matilda Ware, the widow of William Pitts of the East Kent Regiment, who was killed on 3rd May 1917. 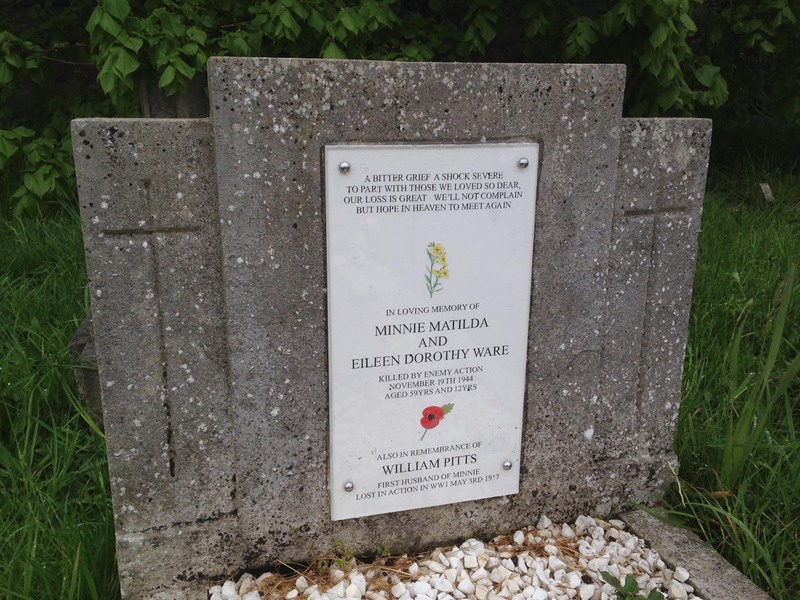 On 19th November 1944 Minnie and her twelve year old daughter Eileen Ware were both killed in the explosion. Dorothy Gardner who also lost her life in the V2 attack was the sister of Alf Byatt who drowned on HMS Formidable on New Year’s Day 1915. 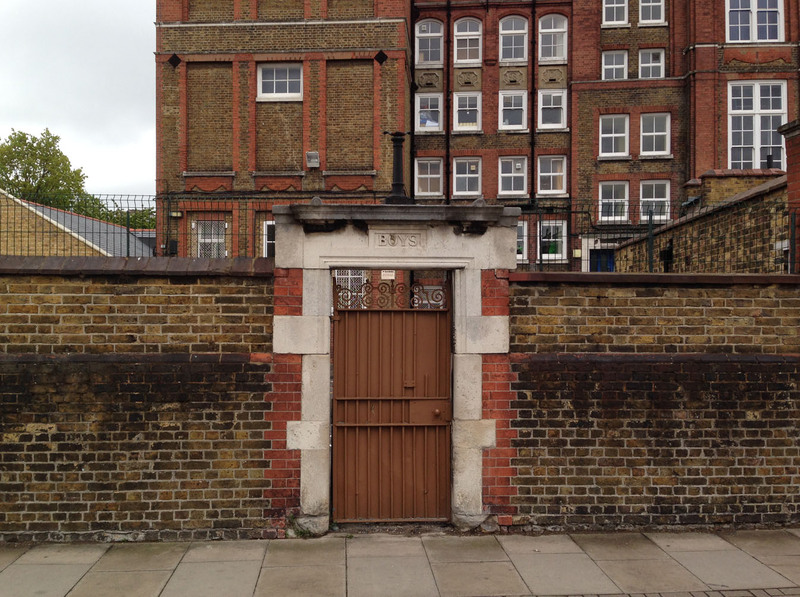 At No46, the brother of William Darvill was blinded by the bomb attack. Also blinded was a First World War veteran called George Keeley. Two of his sons recall waking up that morning and looking at the sky. 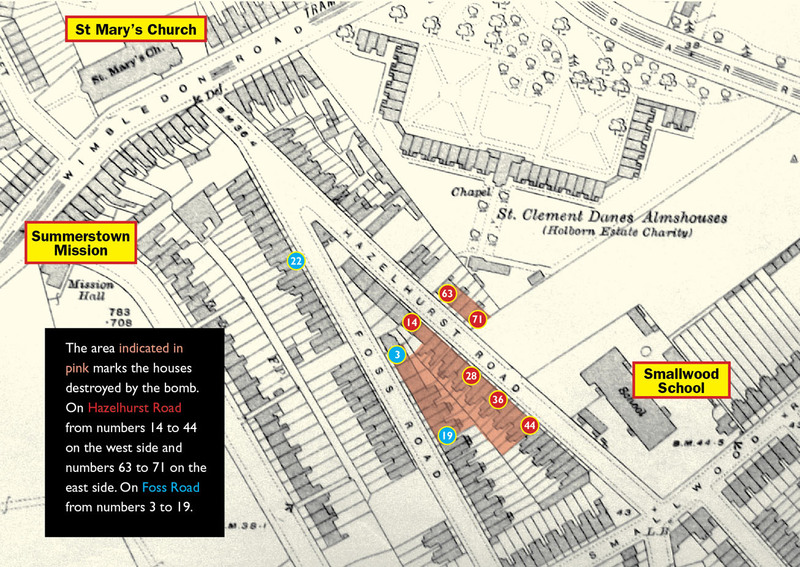 The roof had been blown off their house at No44, directly opposite, the ‘Boys’ entrance to Smallwood School. Conscious of the seventieth anniversary of this event and to create an opportunity to remember, Reverend Dr Roger Ryan, vicar of St Mary’s Church held a Service of Commemoration on Sunday 16th November 2014. The church is just a few hundred yards from where the bomb landed but was only superficially damaged by the blast. 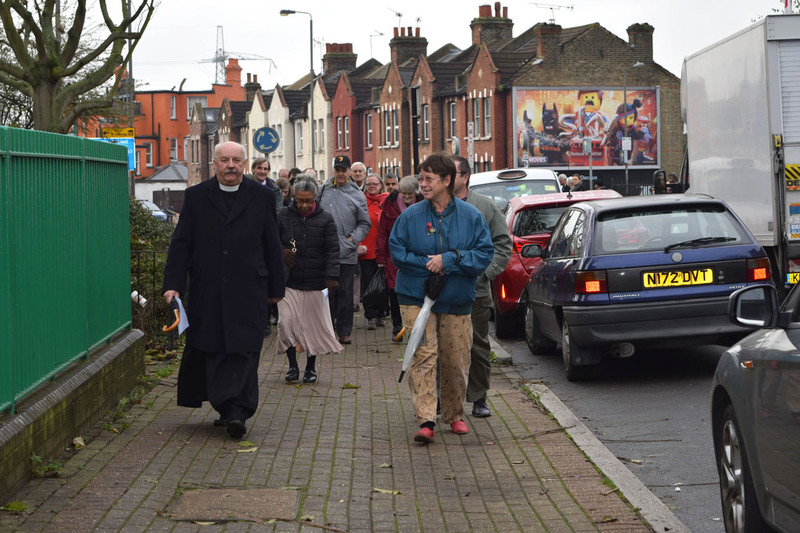 The service concluded with the congregation walking to the place where the bomb fell, the car park behind Sutton Courtney House and observing a minute’s silence. The names of the victims were read out by the relatives and petals scattered in their memory. Sadiq Khan MP read the official Council ‘Incident Report’ and a guitar ensemble made up of students from Burntwood School performed an extrordinarily moving version of ‘Fields of Gold’. You can watch this and see some of the images from that day by clicking on the link below. Following the response to this event, Wandsworth Council have acknowledged the incident with the award of one of their ‘Green Plaques’. This will be fixed to Sutton Courtney House and dedicated at a special ceremony at the site on Saturday 6th June at 4pm. We are very pleased that many relatives of those who were killed or injured are planning to attend. Some people have left copies of personal reminisences or mementoes relating to that day. These will be added to a special ‘Hazelhurst Road Memorial Archive’ which will be preserved in the Church or a local museum as a lasting historical reminder of the event. They currently form part of a display in St Mary’s Church and can be viewed on 6th June. They will eventually form a permanent tribute to a community who rallied round so magnificently in the face of great tragedy. We are still keen to contact anyone with knowledge about the event. 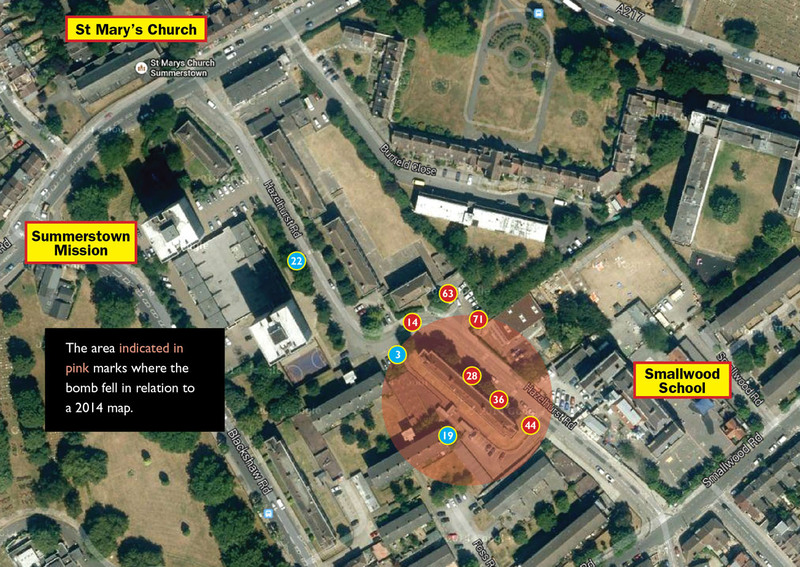 The bomb fell almost directly in front of Smallwood Primary School and many of the children who died would have gone there. 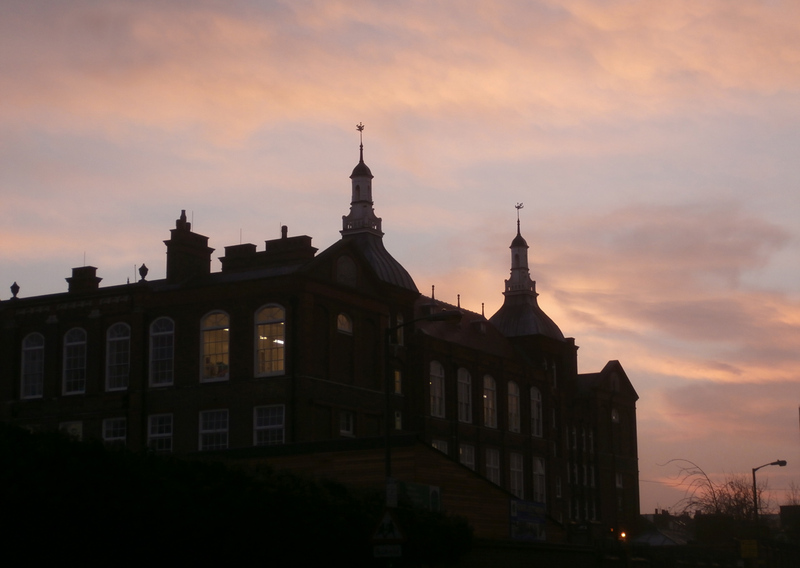 We are very pleased that the school will be involved in the event and with the collaboration of the Hazelhurst estate based ‘Work and Play Scrap Store’, a Tree of Wishes will be on view to which people can add their messages. The names of the 35 people living in Hazelhurst Road who were killed in the attack were: No22 Eileen McVicars (age 19, lived at 13), No18 John Arthur Harold Taplin (8months), No24 Alice Steward (72), Thomas Steward (74), Thomas James Steward (34), William Joseph Millward (51), No26 Josephine Doris Woodley (14), No28 Minnie Matilda Ware (59), Eileen Dorothy Ware (12), No30 Elizabeth Channell (25), John James Channell (27), John James Channell (4), Harry Ogilvie (92), Benjamin Leonard Farmer (37), Thirza Dorothy Farmer (34), Leonard Farmer (11), Dennis Farmer (7), Kenneth Farmer (4) No32 Florence Anne Gardner (38), Ernest George Gardner (32), Dorothy Gardner (32), John William Gardner (8), Ernest David Gardner (3), No34 Terence Bushaway (6months), Cissie Alice Susan Bushaway (42), No36 Florence Betty Ackerman (13), William Joseph Ackerman (10), Florence Nellie Biggs (26), Christopher Kitts (56), Douglas Kitts (24), No38 Winifred Hinson (37), Raymond Arthur Hinson (14), Robert William Hinson (5), Emily Florence Cooper (30), No71 Jane Elizabeth Wilson (66). 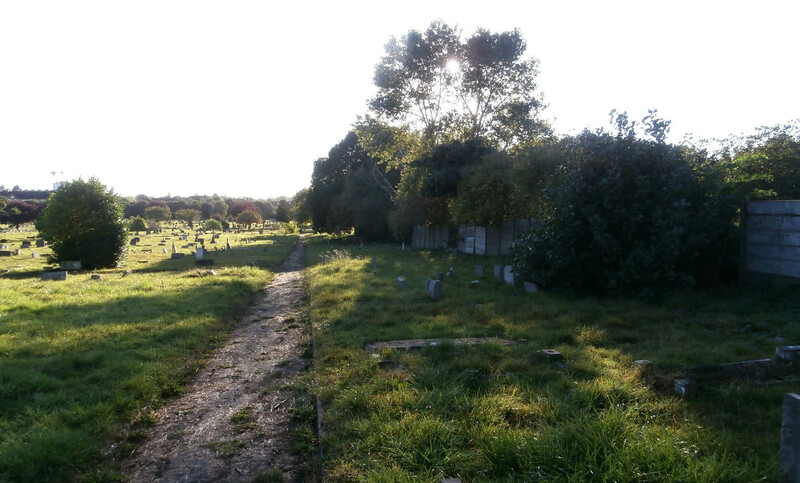 Quite a few of the victims of the bomb are buried in a cluster in the top north-west corner of Streatham Cemetery, near the beehives, with a great sweeping view down the hill to Tooting and St George’s Hospital. Douglas Kitts has a CWGC grave and he has the Stewards on one side of him, the Hinsons on the other. 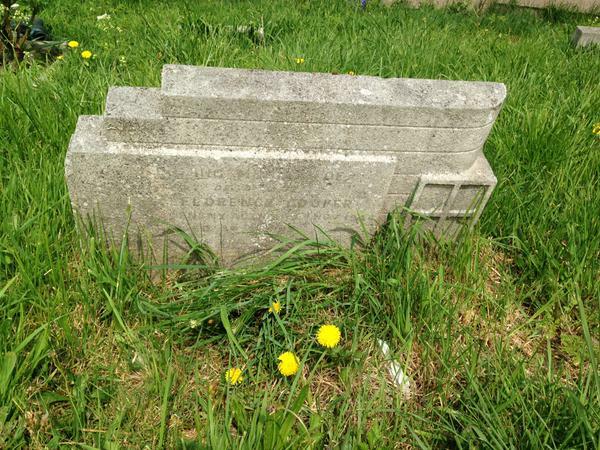 The inscriptions on both these headstones are almost unreadable now and the situation was very similar with the headstone on the grave of Minnie Matilda Ware and her daughter Eileen. The family recently took the decision to fix a more readable plaque to it. Very appropriately this also remembers Minnie’s first husband, William Pitts of the Summerstown182. 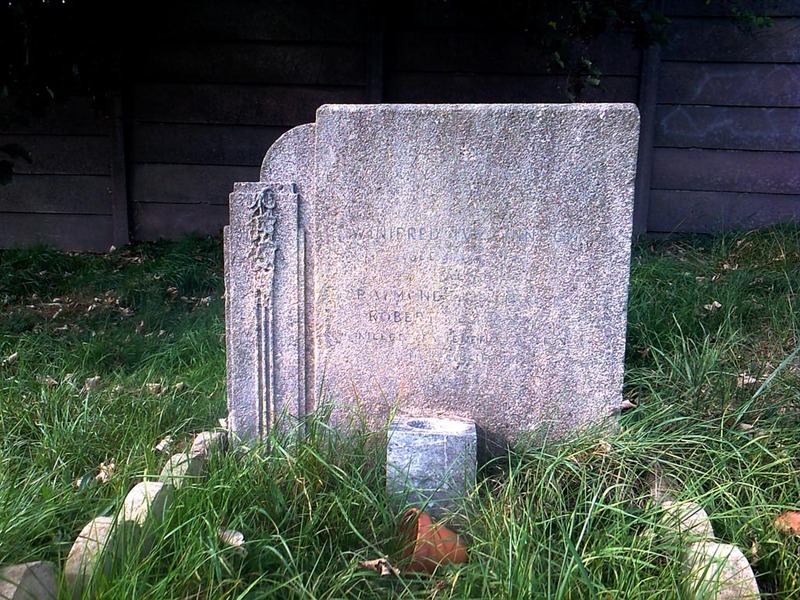 The Bushaway grave commemorates a third family member who was not killed by the V2. 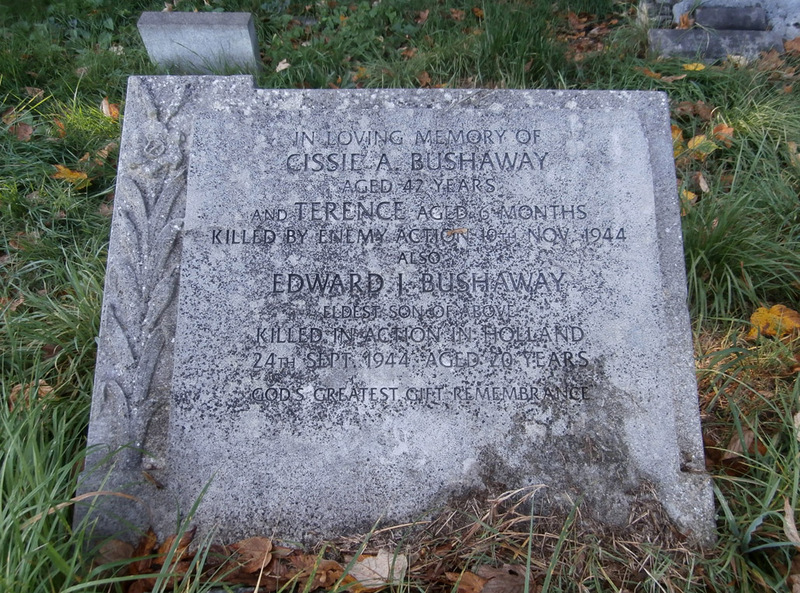 Cissie’s eldest son, 20 year old Private Edward Bushaway was killed in action in Holland. He is buried near Eindhoven. 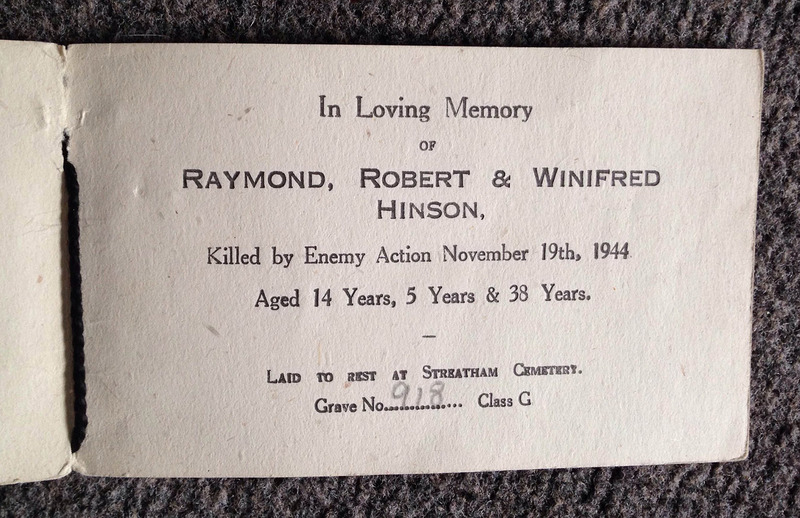 Close to this is the grave of the Hinson family, Winifred, aged 37 and two of her children, Ray and Bobby. Next to that is appropriately the grave of Emily Florence Cooper who lived downstairs in the same house as the Hinsons. 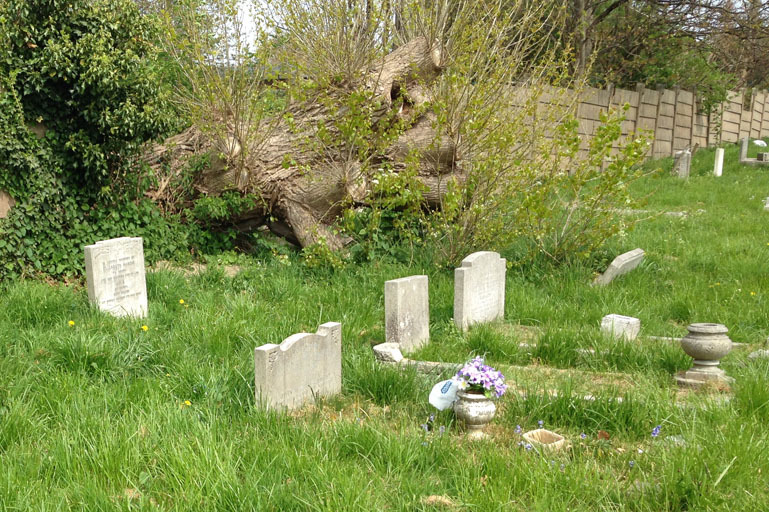 The grave of two of the Gardner family, Florence and her son John, has been pushed forward by a recently fallen tree which has crashed through the boundary wall. 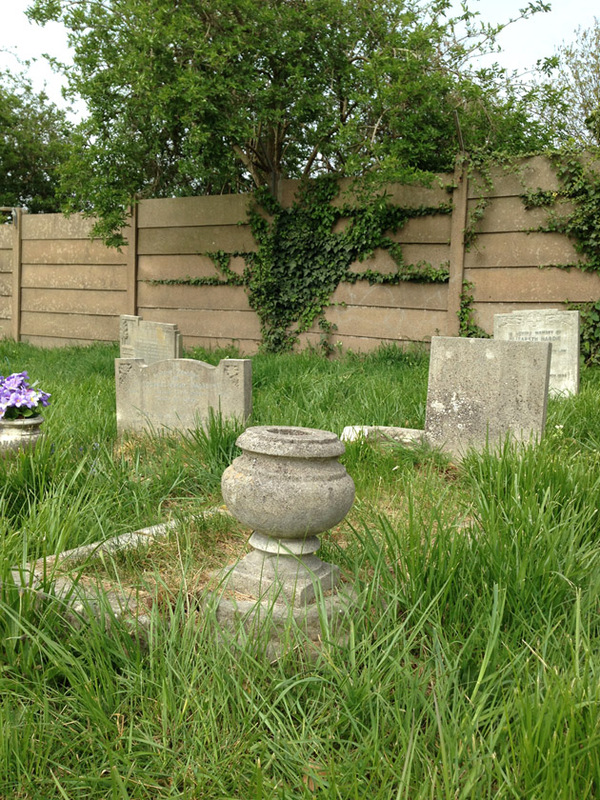 Ernest and Dorothy Gardner are in a separate grave very close by with their children Ernest and Shirley. In a very tragic twist, baby Shirley who was only two weeks old, died of meningitis in St James’ hospital the day before the bomb fell. Six members of the Farmer family are all buried together (below, top photo). 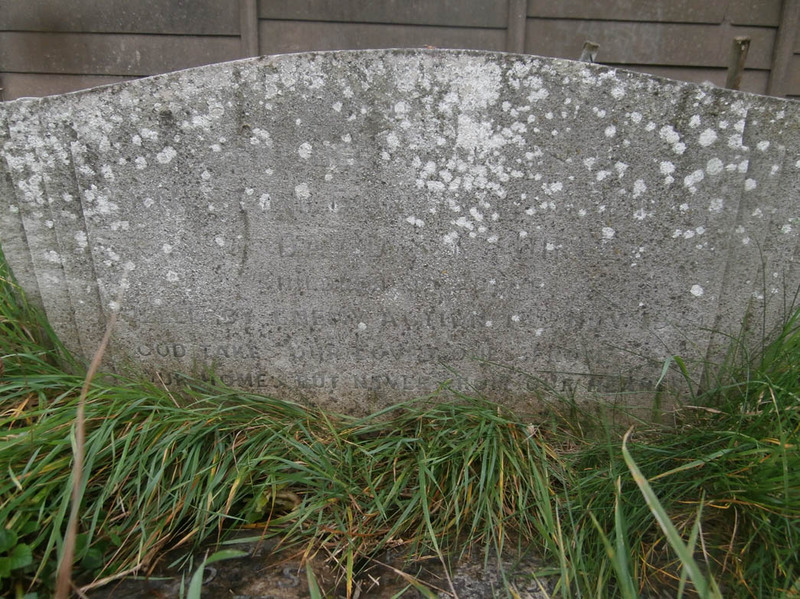 The lettering on this grave has completely disappeared and it is only identifiable by the serial number. 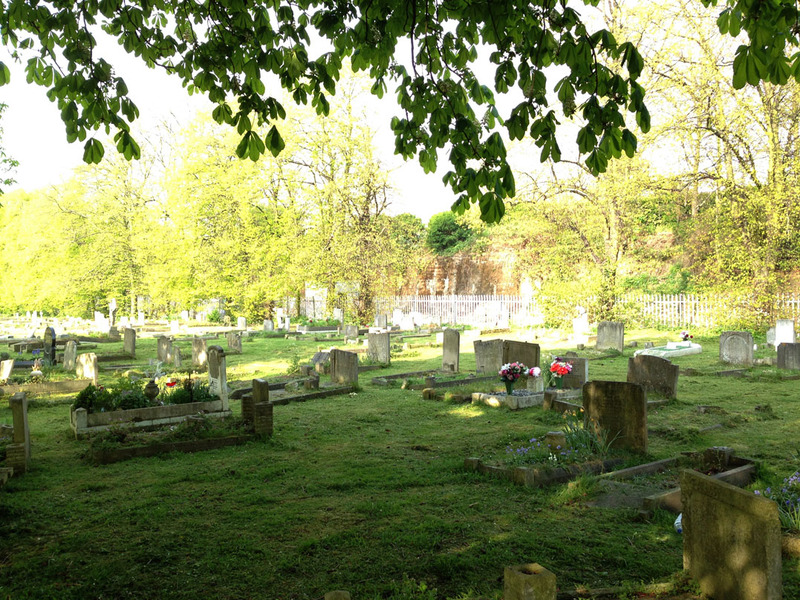 The three members of the Channell family are all buried in Wandsworth Cemetery. The plot is close to a chestnut tree, just in front of the grave with the flowers on it, but very sadly but there is nothing there now to pinpoint it. 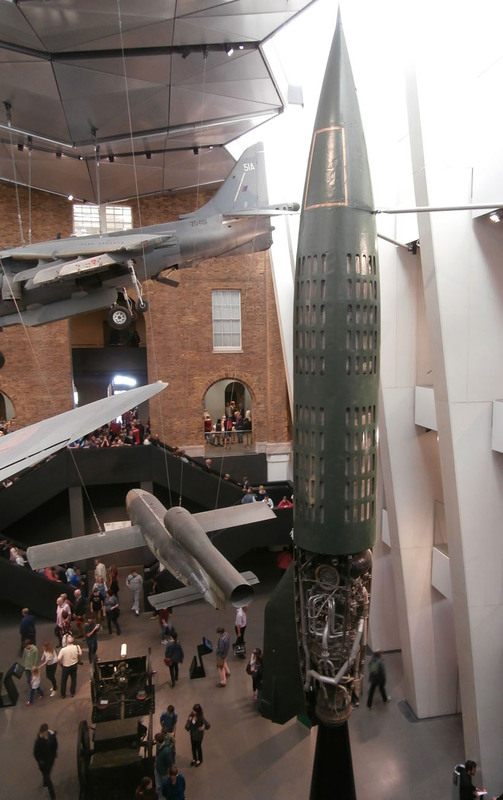 The Imperial War Museum has aV2 rocket on display in its main gallery and although I had seen it many times until taking an interest in Hazelhurst Road, I hadn’t paid it much attention. Visiting the museum the other day I was transfixed by it. Trying to imagine this sleek dark green monster silently falling out of the sky and causing untold misery and devastation very close to my home was almost too much. Since the re-vamp of the Museum there is now a very informative short film to go with it. I had heard that they were produced largely by slave labour but never knew that more people were actually killed in making these weapons than were actually killed by them. I was aware that their creator, Wernher von Braun and his team were spirited off to the United States to work on the technology that a generation later would put a man on the moon, but seeing footage of him being carried on shoulders at NASA HQ left me feeling uneasy. 513 of these rockets fell on London between September 1944 and March 1945, killing 2,754 civilians. Eight of them landed in Wandsworth. 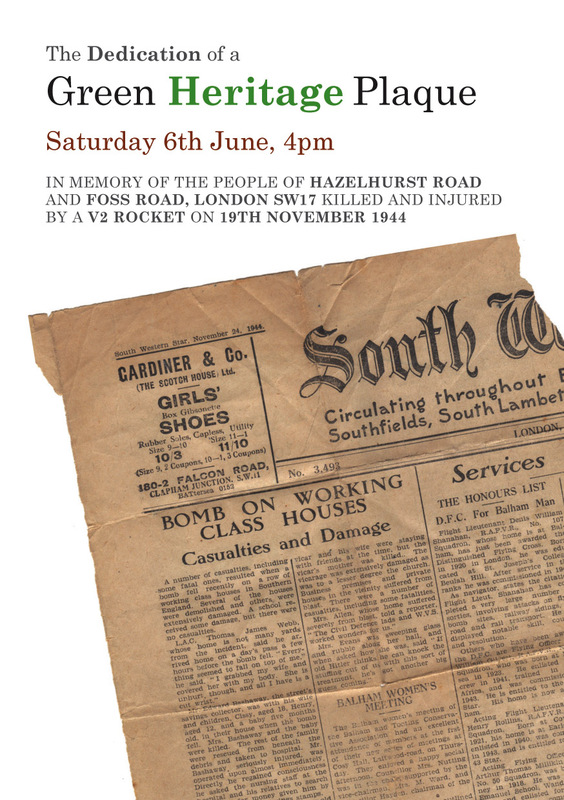 Less than a week after Hazelhurst Road a V2 landed on Woolworths in New Cross on a Saturday afternoon killing 168 people. The worst single incident was in Antwerp in December when 567 people lost their lives when a rocket struck a crowded cinema. Really interesting! My Dad’s family spoke about this incident. They had to be rehomed after this happened. My Dad remembers riding his bike around the bomb sites. Also, terrible story regarding the young baby who had been outside a house in their pram. I grew up on the Hazelhurst, my Dad still lives there to this day. Thank you for putting this all together.